There will be high visibility patrols over the upcoming holiday weekend to “discourage those members of our community that might seek to disrupt our holiday with acts of anti-social behaviour or criminality,” Detective Superintendent of Police James Howard said today. Mr Howard said, “Over the last few years we have received some very positive feedback over as it relates to the Police Service partnering with the Bermuda Regiment, Parks Department, the Bermuda Reserve Police and other agencies during this period. This partnership will continue to ensure that all venues for major events are safe for all of us to enjoy. “It is Cup Match time in Bermuda. It is a time to reflect, remember and celebrate who we are as a community. The Bermuda Police Service [BPS] wishes to take this opportunity to advise the public on a number of matters, to ensure a safe time for all during this year’s Cup Match holiday weekend. “The purpose of this press conference is more about safety and less about how we intend to police this weekend holiday. “As there are a number of events taking place over this four day holiday weekend, there will be high visibility patrols. There are two intents for this. The first is to discourage those members of our community that might seek to disrupt our holiday with acts of anti-social behaviour or criminality. “The second is to continue applying the objectives of our Road Safety Strategy which include reducing road traffic collisions in all areas from damage only to injury to fatalities; combating anti-social road use and reducing incidents of impaired driving. In order to apply these objectives the BPS will engage those persons within the motoring public at all levels from merely having a present to issuing of motorist advice notices to enforcement by tickets and/or arrest based on relevant legislation. The intent is to influence driver behaviour, making the roads safe for all of us as we travel to the many events planned. “Over the last few years we have received some very positive feedback over as it relates to the Police Service partnering with the Bermuda Regiment, Parks Department, the Bermuda Reserve Police and other agencies during this period. This partnership will continue to ensure that all venues for major events are safe for all of us to enjoy. “The BPS will continue to use CCTV proactively throughout this weekend. 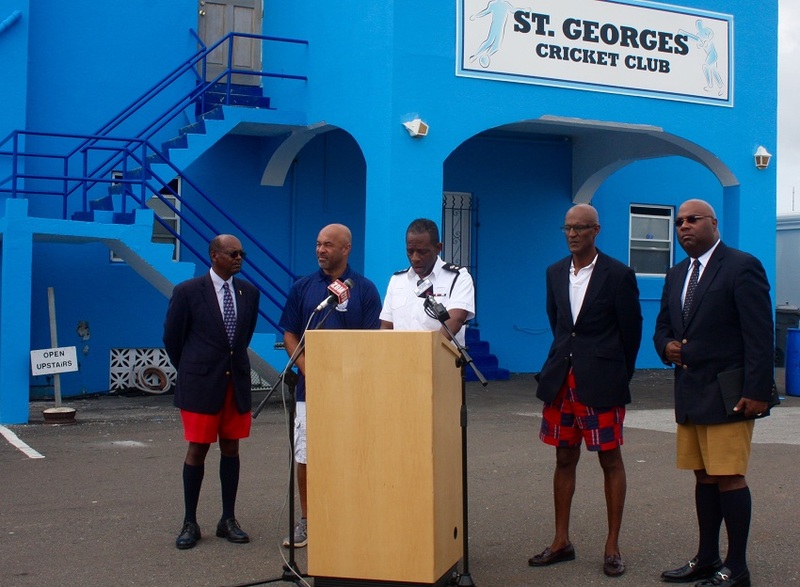 There will also be extra CCTV set up by a private contractor at the St. Georges Cricket Club which will be monitored by both security and police officers. “I would also like to remind the public that on Thursday and Friday of Cup Match, road closures and parking restrictions will be in effect in the area of St. Georges Cricket Club. We will try to keep disruption of the motoring public to a minimum. “As many of us are aware, locals and visitors alike, take to our beaches and the water as a form of relaxation and fun over the Cup Match holiday weekend. There is always a major increase in water activities which include the use of jet skis; privately owned vessels; vessels hired from rental companies and chartered cruises. In Partnership with the Bermuda Reserve Police and the Bermuda Regiment there will be an increased visible joint law enforcement presence on the water. “Many if not all are aware of the Non Mariners Event Scheduled for this coming Sunday. This event attracts hundreds of vessels and thousands of spectators. I mentioned this only to remind the boating public that the Department of Marine and Ports has issued a marine notice to all vessels. The waters of Mangrove Bay from Kings Point to the Watford Bridge on Boaz Island will be restricted to a 5 knots no wake restriction between 12pm – 8pm. Personal water craft [Jet Ski’s] are prohibited from entering the Mangrove Bay area East of Kings Point and the Watford Bridge. “I would like to remind the boating community to make certain that their vessels are registered; that a current 2015 decal is prominently displayed on the starboard side of the vessel; that all required safety equipment is on board; and that they are carrying enough fuel for the intended journey. It is also recommended that a float plan is filed if they intend to go offshore. “Additionally, speed is an issue not only in marine collisions but in the general nuisance factor that is experienced by boaters at anchor near the shoreline. The boating community is reminded of the need to exercise care and caution around other vessels and to be on the lookout for swimmers. “The 5 knot – no wake areas will be strictly enforced in order to calm the marine traffic. We also encourage that persons do not mix any use of alcohol with power-boat operating or sailing. “Loud music complaints both in residential neighborhoods and on the water can become a problem associated with this Holiday and we accept that the celebration of Cup Match brings with it a party atmosphere. I ask only two things of the public: patience and tolerance on the part of the complainants, along with a display of respect and courtesy on the part of the subjects. I encourage members of the communities that they live in to work together to keep the peace in the neighbourhood and avoid involving the police. “As a reminder to all of us, please ensure your homes are secured when leaving for Cup Match, weekend events or camping. “During the early hours of this morning, a car apparently struck and damaged a utility pole along a section of Middle Road, Southampton in the vicinity of Five Star Island. Traffic diversions have been in place since then and will continue until the situation can be rectified by BELCO. Traffic travelling from the west should divert along Church Road, Southampton. Traffic travelling from the east should divert along Lighthouse Road, Southampton. Typical lazy BPS policing of the non-mariners event by banning jet skis. A few drivers act reckless on the roads but you don’t ban everyone from driving do you? I own a jet ski and I obey the laws of the water I should not have to suffer because the BPS cannot be bothered to police the waters effectively but there again I expect nothing less from them. ” I should not have to suffer”. No law says you cannot ride/operate a jet ski. Don’t blame the BPS, blame the drunk idiots who blast around between rafted up boats. Also blame the courts for not backing up the BPS with penaltys for such borish behavior. Too bad the BPS cannot confiscate jet skis on the spot & charge owners for costs incurred for handling the machines in addition to fines. It is an awful shame that instead of being able to operate with reduced numbers & enjoy the holiday as well, th BPS have to have everyone on duty to control the morons. Like I said above, the police don’t ban every driver or bike rider that drives/rides like an idiot do they? Similarly they shouldn’t be able to do it in this instance. Also, I would be in complete agreement of confiscating jet skis from irresponsible owners. Not only that, but how many jet riders have run their watercraft aground leaving non-Mariners? I think you’ll find the answer is non. lol they cant ban a jetski without a law banning them…you would be a fool to think otherwise. Jim Bob you are correct. It should be enough that they said it is all 5 knots the other side of Watford Bridge. However, many years experience tells us that all boaters follow this rule except Jet Skiers. Year after year, they seem to think they are ‘spashul’ and don’t have to obey the rules that everyone else does. Worse still, the Police let them get away with it. Why on earth Jet Skiers seem to think that everyone wants to see them show off in a dangerous manner is beyond me. How odd that the only boat without a reverse gear is the one that is consistently the most reckless. So next time you do the one trick all Jet Skiers do (like you think you’re the inventor of ‘the 360′) please forgive me if I’m not impressed. And next time you think it is ‘fun’ to race around dodging between a load of boats that are closely anchored where kids are swimming, please forgive me if I give you the traditional one finger salute and shout something associated with the achronym ‘FO’. Jet skiers brought it on themselves. If you sir are mature enough to obey the law, then perhaps you are ready for a proper boat. Have a great Cup match everyone and stay safe. What if you lower your ski into the waters by the club? Will you still be fined for being in the area?? So ban all boats because every year at least one seems to run aground when leaving non-Mariners? Would that be an appropriate response to the matter? Also, for avoidance of doubt many jet skis do have a reverse gear and not only that, the newer ones like mine, they have a braking system which is more than I can say for boats.